Ok, so you know I don't really care for cookies. Particularly not packaged ones. But everyone knows I love desserts, so, from time to time random baked goods show up on my doorstep. Like Grandma's Cookies. 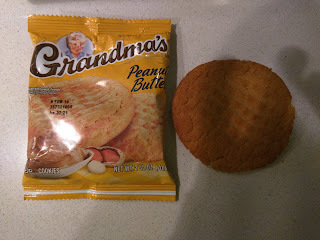 No, not MY grandma's cookies, but Grandma's cookies, produced by Frito-Lay. The company description makes these seem, well, like something Grandma might make I guess: "GRANDMA’S® cookies offer a delicious variety of homemade memories. With flavors like chocolate, peanut butter and lemon pie, every GRANDMA’S treat is baked with love to transport you to your happy place with every bite." Except, well, they are pre-packaged cookies, with a scary shelf life. Grandma's has several different lines of cookies, including the "Frosted" collection, with pictures of great looking baked goods on front, like the Frosted Cinnamon Roll, Frosted Lemon Pie (featuring a meringue topped lemon pie), Frosted Blueberry and White Chocolate (with a great looking muffin), and red velvet (classic cupcake). Of course, the cookies don't have meringue, cream cheese frosting, etc, but the photos sure look good. They also make Sandwich Creme cookies, basic crispy plain cookies stuffed with assorted flavored creme filling, in peanut butter, strawberry, vanilla, or lemon. The real quintessential cookies though are probably the "Homestyle" ones, available in the classics of chocolate chip, oatmeal raisin, and peanut butter, along with peanut butter chocolate chunk and chocolate brownie. It is these that I tried. If you are in the market for packaged cookies, you can find these anywhere, as in, even at Walmart or your neighborhood convenience store, generally sold as two-packs. I'll be honest. The cookies aren't ... bad. The cookies are large, not like a Chips Ahoy or standard packaged cookies. They do actually look like they could be homemade. And, they really are quite soft. Yes, they actually seem like they could have been made by grandma yesterday, not months ago in a factory. Not that I want more of these, but, they were better than expected. "GRANDMA'S Chocolate Brownie Big Cookies are a delicious combination of great taste and good fun baked into one great snack." I started with a chocolate brownie cookie. I figured I'd get the one I was least like to like out of the way. Well, huh. 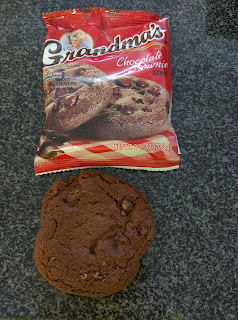 The chocolate flavor wasn't particularly rich, although it was clearly a cocoa cookie, and had some little chocolate chips in it (although not nearly as generously distributed as in the wrapper picture). I liked how soft it was, and how "real" it looked. But, it did have a strangely plasticky flavor, and a bit of a stale aftertaste. Ah yes, all those random ingredients thrown in there to preserve them, really do make a difference in taste, and, not a good one. I even took a second bite of this, but in the end, the aftertaste did me in. If the aftertaste wasn't there however, these really would be worth eating. "Perfect for satisfying your intense craving. 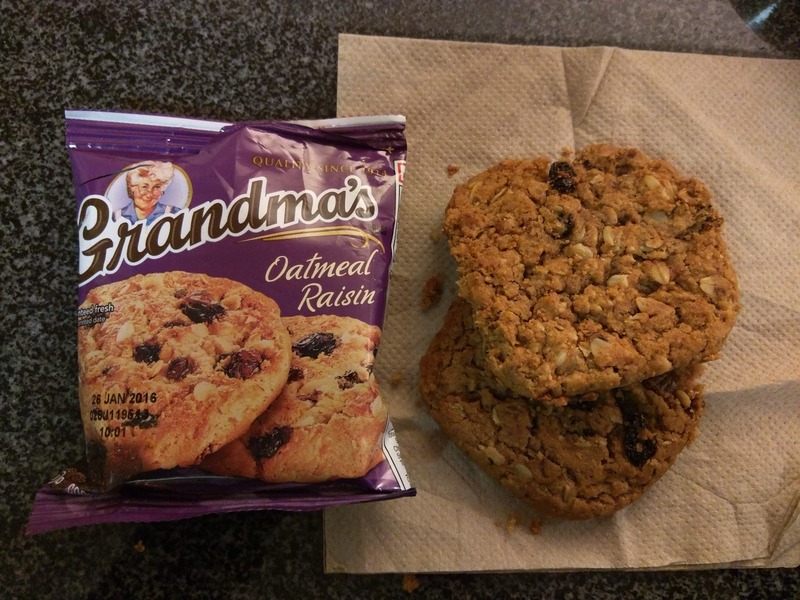 Grandma's Oatmeal Raisin Big Cookies are a unique combination of great taste, great crunch and good fun rolled into one great snack. The only thing better than this big soft delicious cookie, is another!" Next I moved on to the one I was slightly less skeptical of, but still not excited by: oatmeal raisin. Like the Chocolate Brownie cookies, the oatmeal raisin were super soft, and again, they really did look homemade. One of my cookies was so soft that it broke as I pulled it out of the bag, but, I don't consider this a bad thing. The cookies had some oats, and plenty of raisins. The raisins were soft, not hard little pellets. The cookie was very sweet, not a slightly more healthy style that you sometimes get with oatmeal raisin. It had a slightly complex sweetness though, from the molasses used for sweetener (well, in addition to high fructose corn syrup and regular white sugar of course). These really weren't bad. As I'm not really much of a cookie eater, they weren't super exciting to me just as cookies though. I wanted to crumble them up on top of some warm fruit and serve with whipped cream, basically making them into a crisp topping. Or I wanted to stuff them with cream cheese frosting, or at least ice them. Or even make an ice cream sandwich out of them. Don't get me wrong, they were fine plain, but, a plain cookie just isn't my thing. "A Classic Favorite. Both grandma's blend the finest ingredients with the creamiest peanut butter to make a tantalizing treat." Ok, if the other cookies looked fairly homemade, this one really, really looked homemade. It was even a little ... burnt. Darker than you'd like. It also had the little marks on top as if grandma had pressed her fork tines into the top. Nice little homemade touch. But the cookie ... wasn't very good. It was soft, but not moist. 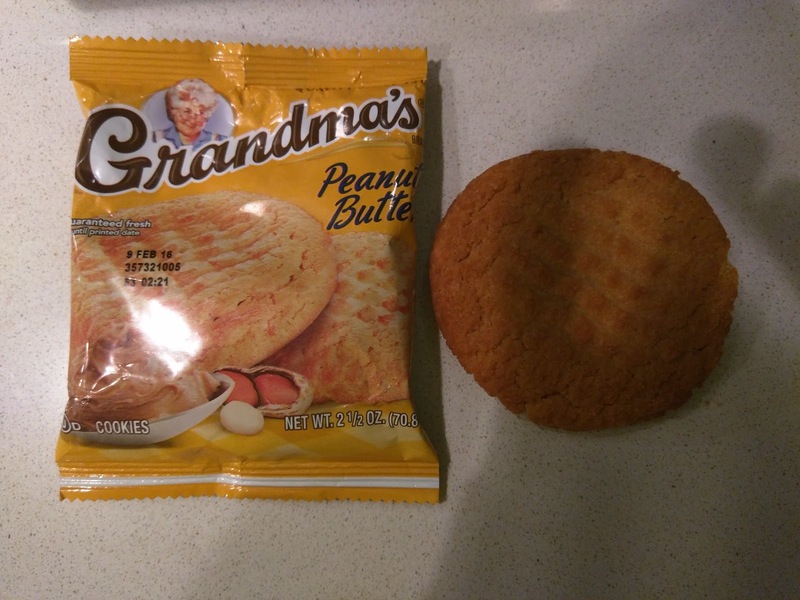 It didn't have great peanut flavor. It just wasn't very good. My least favorite of all the cookies. 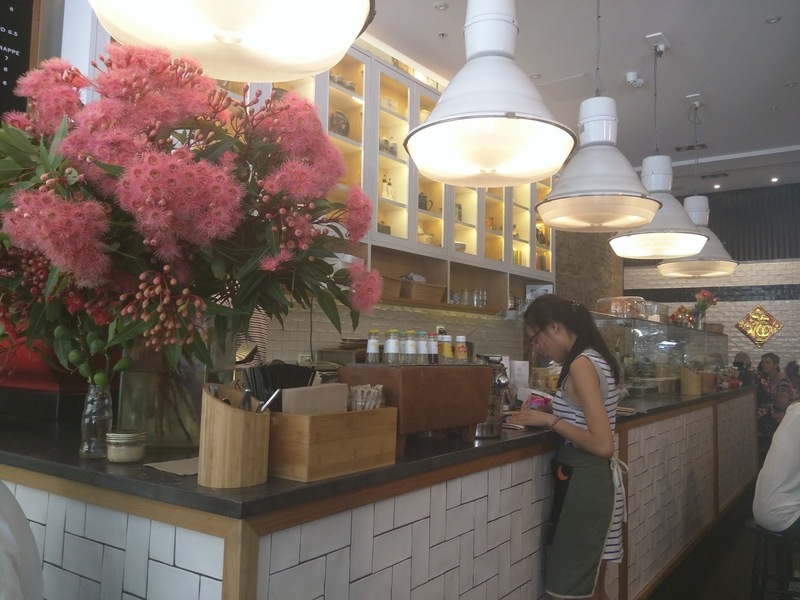 Boon Cafe is not just another cafe in Sydney. 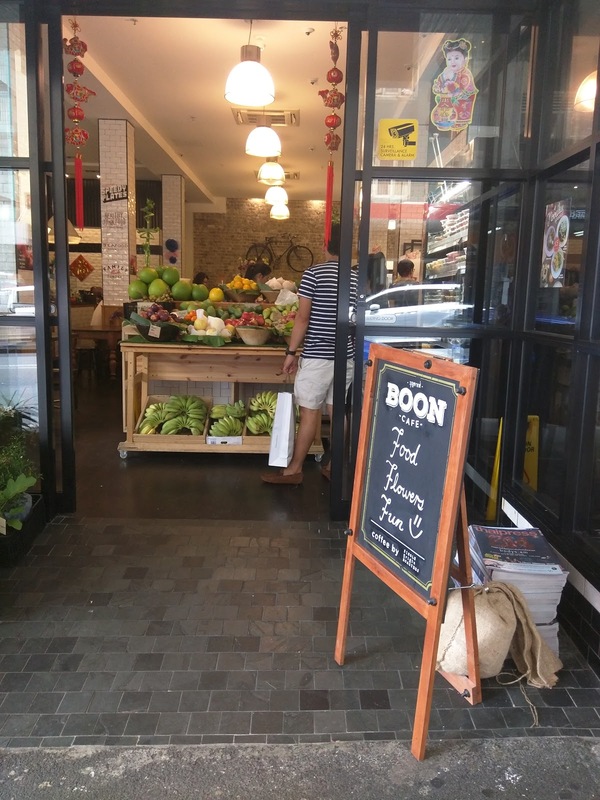 While I adore the cafe culture in Sydney, Boon is something quite different. For one, it is located on the side of a Thai grocery store, somewhat reminding me of Cafe Sopra and Fratelli Fresh. 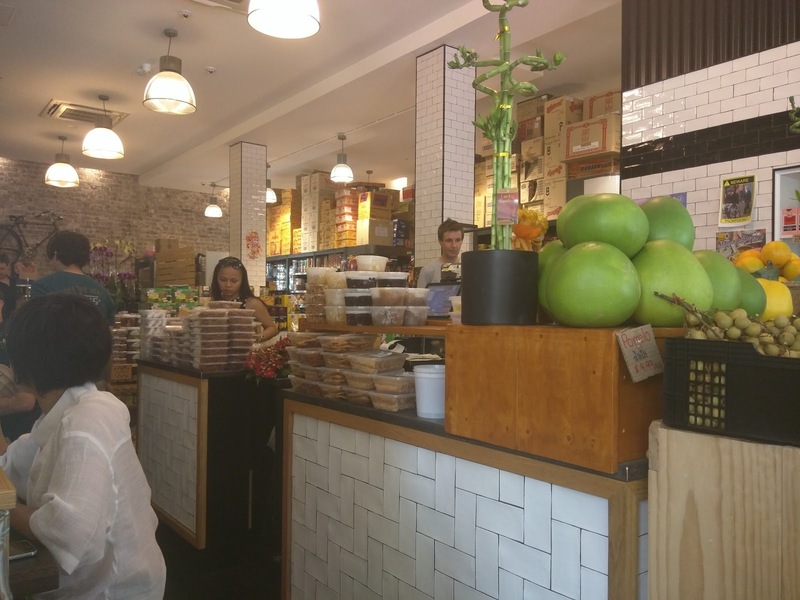 The cuisine is thai, always a favorite of mine while I'm in Sydney, and it is brought to you by the folks behind Chat Thai (which I've visited many times). However, the cuisine is quite different from the numerous other Thai restaurants around town. During the day it is a cafe, serving breakfast in the morning (eggs, congee, pastries), lunch (rice bowls, noodles, sandwiches, salads, desserts), and then at dinner, it completely transforms, serving Isaan cuisine from north-eastern Thailand (lots of flavor, gutsy ingredients). From my research, Boon sounded really unique, and like a good choice for a casual meal one Sunday afternoon. And it was. My visit was around 12:30pm, on a Sunday. I had eyes on the fantastic sounding pandan custard toast, while Ojan was looking for a regular, although light, lunch. We both wanted fun drinks. And Boon completely fit that bill. Service was good, the food was decent, and it was indeed a unique experience. We returned several more times for drinks throughout the week, and were satisfied every time. I was seriously eyeing their perfect looking croissants, but never got around to ordering one. I'll be happy to return to try more drinks and some more sweets, although I don't feel particularly compelled to go back for the savory food, as there was nothing that I felt I "need" to have. As I said, Boon is on the side of a Thai grocery store. You won't find a large sign for Boon Cafe on an awning, as the sign on the awning is for the grocery store. Instead, they just have a little folding sidewalk sign out front. You can order takeaway at a register, which many people did, usually just for a drink or pastry, as they swung through the grocery store. I did this too, once I realized they use Single Origin espresso! Or you could ask to be seated, which, we did on our first visit. 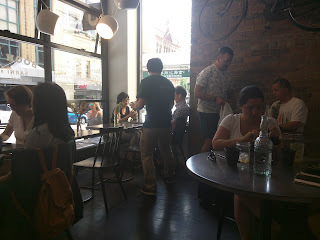 There aren't many tables, just a few small ones along the sunny window, and a few stuck into the corridor between the cafe and grocer, which is where we were seated, as we got the last table. From our table, we had a view into the grocery store, which had a steady stream of traffic. We wandered through afterwards, and stocked up on some treats. They packed a ton into the little store, including fresh fruits, packaged desserts, tons of candy, and pantry staples. To say the drink menu at Boon is extensive is an understatement. I think I spent at least 15 minutes pouring over the drinks menu, even though I had seen it online before. I had such extreme indecision paralysis. The menu had pages and pages of drinks, each page getting more exotic than the previous, all with illustrations. There were hot drinks, cold drinks, icy drinks. Sweet drinks, bitter drinks, refreshing drinks. American drinks, Thai drinks, trendy drinks, classic drinks. How. To. Decide. I wanted coffee, as Boon sources their beans from my favorite roaster in the city, Single Origin. But, I can get decent coffee other places. Then they have very fancy hot chocolate, available in several varieties (dark, hazelnut, caramel). And iced coffee, iced mochas, iced chocolate. Or an affogato. Or frappes. There are also fresh pressed juices and blended fruit drinks. House made iced tea tisanes, in a variety of flavors like pandan, longan, lotus root, and more. Plus traditional thai drinks, including multiple types of thai tea and coffee, hot and iced. And then a slew of other drinks, like "pink cold milk" or "green syrup with soda". 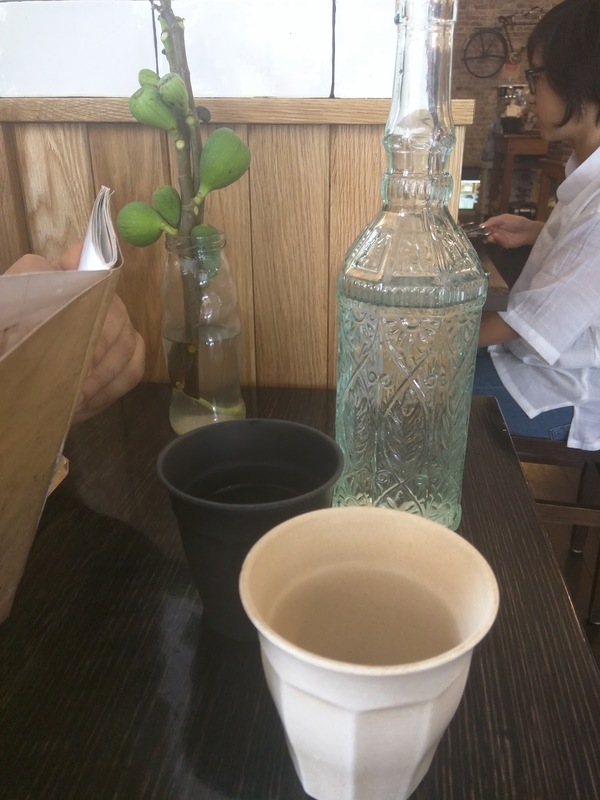 Our server brought over a jug of tap water, and two mismatched cups, moments after we were seated, a nice touch, particularly on a hot day. Also on our table was a jug with water, and a sprig of figs. Can they really grow once removed from a tree like this? I have no idea. "Cold pressed turmeric, milk & Vallentines medicinal honey." Since Ojan can't have caffeine, he doesn't often get fun hot drinks, so he was thrilled by the drink menu. 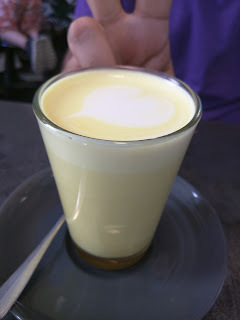 The "Goldilocks Latte" caught his eye, as it was a non-caffeinated latte, made from turmeric, milk, and honey, no coffee. Totally not things I like, but it suited him fine. I took a sip, and it was very bitter. Where was this promised honey? Ojan thought the same thing, saying he liked it, he liked the turmeric, but, he really wanted it sweeter. And then he got near the end, and found all the honey. Doh. It either wasn't mixed in well, or had settled all to the bottom. Anyway, this was clearly not a drink for me, but he enjoyed having something like a latte sans caffeine. A few days later, we returned to Boon for drinks. 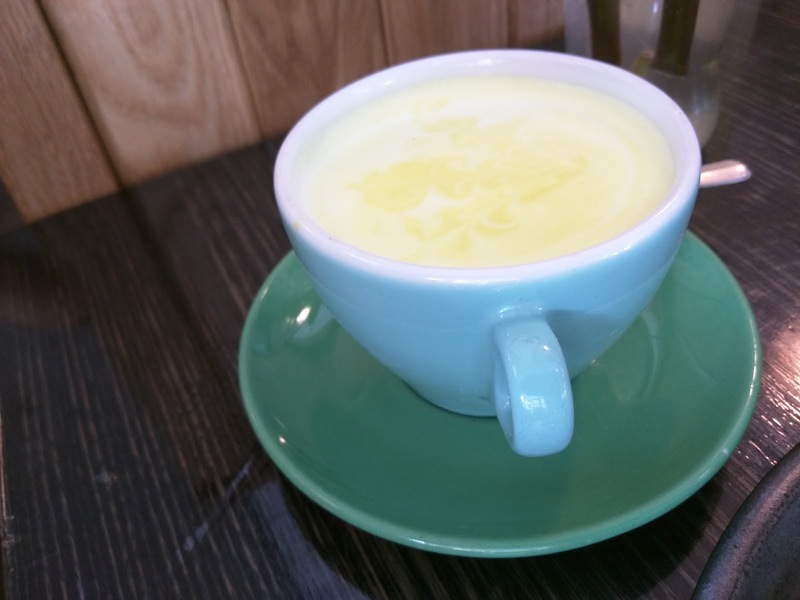 This time, Ojan's Goldilocks latte was served in a glass, rather than mug. And this time, he heeded his own advice from last time, and stirred it first. And ... this time it was too sweet. Perhaps it just had more honey in it than before, but, he ended up not liking it, and didn't finish it. I wanted a little bit of caffeine, and I just can't resist matcha. My matcha choices were hot, iced, or a frappe. 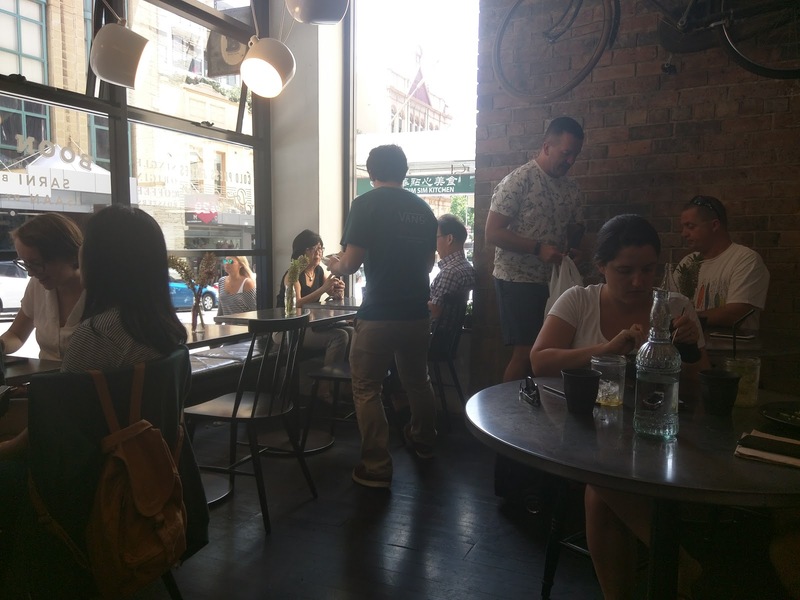 I went for the most fun version, the frappe, a regular item at coffee shops and cafes around Sydney, far more common than in the US, probably because the weather is so warm? It was a hot day, so an icy drink sounded perfect to me. I meant to add on whipped cream (+$0.50), but forgot. Doh. In the photo on the menu, the whipped cream looked so good! I also meant to ask for it sweetened, but forgot that too. I was just too overwhelmed by that drink menu! The frappe was really nicely blended, and clearly made from legit matcha, it was crazy bitter. I mixed in some sweetener myself, and it was exactly what I wanted. 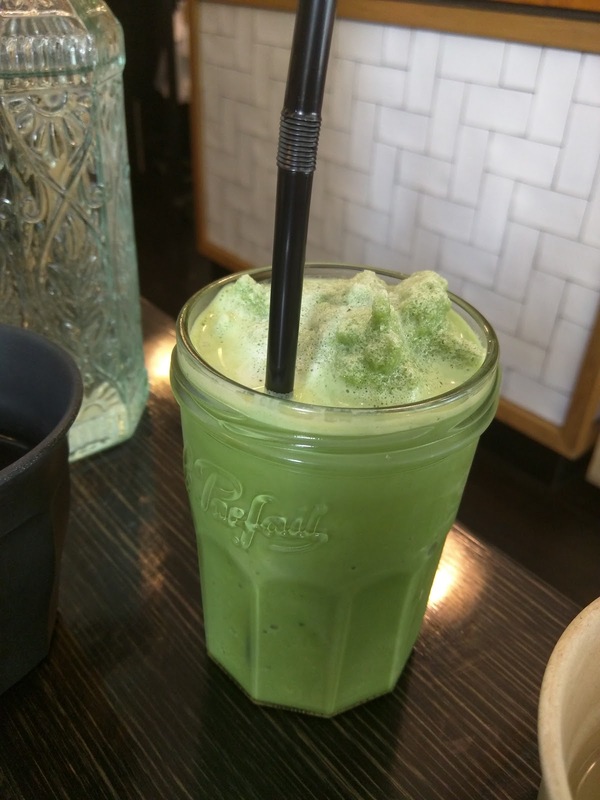 If I was in the mood for a frozen matcha beverage, I'd definitely get it again, although, I wish they had boba or other fun add-ons. And I'd get it sweetened, and probably with whip next time. On the next visit, I just wanted a simple coffee to go along with some sweets, so opted for a long black, decaf. They use Single Origin roasters, always my favorites for decaf in Sydney. It isn't amazing decaf, and is a bit more acidic than I like, but, it is better than most. This coffee was fine, I'm sure the regular would have been better. 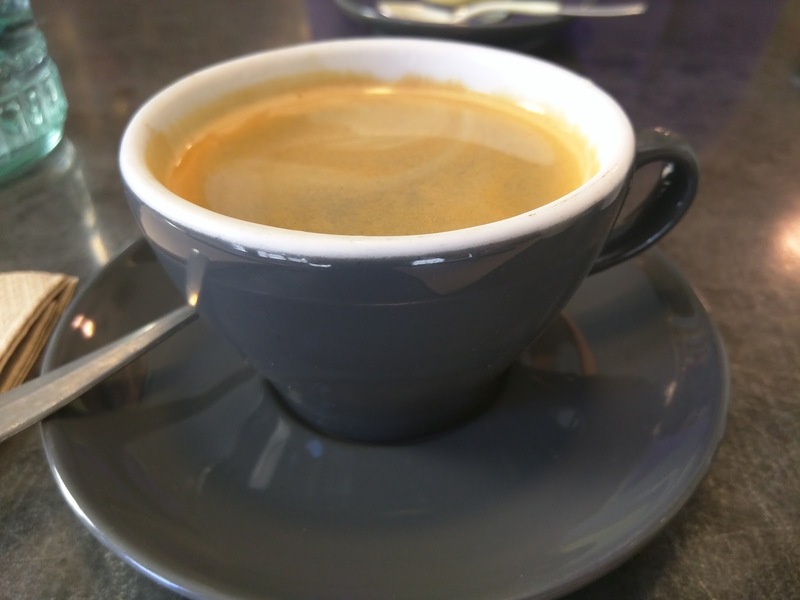 They use two different roasts from Single Origin for regular coffee, depending on if you are having it black or white (aka, lattes, etc). The menu is radically different at lunch and dinner, our visit was at lunch time. The food menu is also fairly extensive, and, illustrated, just to make deciding that much harder. 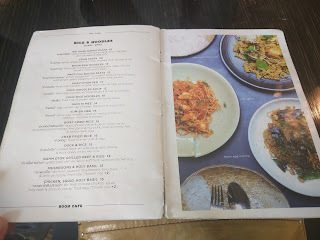 We skipped over the breakfast menu, served from 8am-11am, since it was 12pm, but it included a bunch of egg dishes (not your standard American/Australian picks, although there was a ever trendy avocado and soft boiled egg on toast option! ), along with several varieties of congee. Next came sandwiches and rice bowls, available from 11am-4pm, none of which looked very traditional to me, some open faced, some on sliced bread, some in buns. I have to admit though, they looked good, even the crispy chicken and papaya salad sandwich. Continuing on was pages of noodle dishes, also available 11am-4pm, many made from interesting types of pasta, like kamut fusilli or kamut spaghettini, although traditional egg noodles and rice noodles were also in the mix. There was a crab pasta with smoked chili that looked pretty good, and a bacon pasta, and then a ton of fried rice options. Then, the som dtum menu, with no fewer than 13 different salads. Seriously. These are available from 12 - midnight, so, lunch and dinner. I thought it was interesting that some of the lunch menu started at 11am, and some at noon. It was hard to really tell the difference between all the salads, besides different variations of peanuts or not, dried shrimp or fish or crabs, some with noodles, some with greens. And then the part of the menu I was excited by, the "snacks", mostly composed of sweet toasts, plus, "ice bread", which really I may have to get sometime. Shaved ice, toast, and syrups, all in one dish? Fascinating. Other sweet options included house made pastries on display by the counter at front, and gelato, available in really interesting flavors (cashew butter, single origin coffee, fresh coconut, banana & chocolate), available with fun toppings (salted caramel, pandan custard, dark chocolate, condensed milk), and served optionally inside a crispy bun. We were there around 12:30pm, and Ojan and I were on totally different schedules. He wanted a light meal, a salad, and I wanted sweets. This worked well, as he was able to select from one of the zillion papaya salads, and I could get a sweet toast, and we could dine together, no problem. Dtum Thai Bpu, 1 Chili. $13. "Spicy green papaya salad w/dried shrimps, pickled crab *contains peanuts*"
Ojan wanted something light, so he opted for a papaya salad. He had many, many choices for which particular salad, but settled on this one because he wanted one that wasn't too spicy, and, included peanuts. He was asked how spicy, and he said "mild", and the server then asked, "one or two chilis?". He said one. Seemingly moments later, the salad was ready. Shockingly fast. 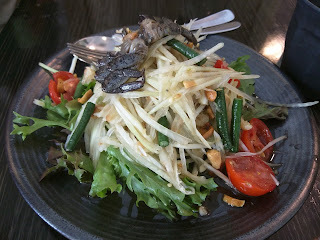 For the most part, it was a pretty standard papaya salad, not particularly remarkable, with shredded green papaya, cherry tomatoes cut in half, crispy green beans, peanuts, little dried shrimps, served over some lettuce. It wasn't very spicy at all, but, he asked for only one chili (note for next time: definitely go for two!). I liked how crispy the beans were, but the dried shrimps did make it kinda fishy tasting. And then, there was the crab on top. Ojan avoided it for the most part, although I kept telling him he had to eat it. Finally, he asked the server about it, and she said that yes, you could eat the body, but warned that it was salty. His expression as he tried it was priceless. He said it was salty. And fishy. "It tastes like the ocean!" he finally declared. He kept trying it, unsure of if he liked it or not. Eventually he concluded that he did not like it. Anyway, it was papaya salad, no more, no less. Fresh enough, but not exciting. I guess it is what he wanted? Toast & Spreads (white, pandan custard). $4. As for me, I wanted something sweet, and had my eyes on the "toasts and spreads" section of the menu. I could choose from three types of bread as my base: white, sourdough, or croissant, and many types of topping: sugar, condensed milk, milo, jam, peanut butter, salted caramel, house roasted cashew butter, chocolate hazelnut spread, and pandan custard. My toast arrived a few minutes after Ojan's salad, which was perfect, as I had time to have a few bites of his savory salad just to try it, and then I was able to dig into my dish when it was hot. And, it was delivered hot, freshly toasted. I really liked the white bread, thick slices of fresh, fluffy, slightly sweet, white bread, cut into strips, and assembled into a tower, with the pandan custard all over it. There was also a bit of coconut milk (or condensed milk maybe?) on the plate. It was served with two wooden sticks to spear the pieces. I really loved my first couple pieces. They were hot, soft, comforting. 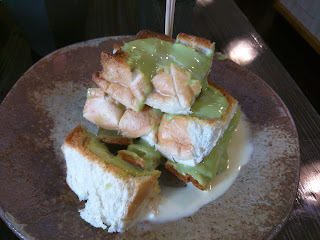 I loved how fluffy the bread was, and how it soaked up the pandan custard. Really simple, but comfort food. Some of the edge pieces however were more toasted than I'd like, hard, crispy, and didn't soak in the custard as well. And, it cooled quickly, and I liked it far less when it wasn't warm. So, overall, I enjoyed it, but I think it would be best to share, and each just have a couple sticks before they cooled down. This was a big serve for me to eat fast enough on my own, and Ojan only took one bite before deciding he didn't like it.